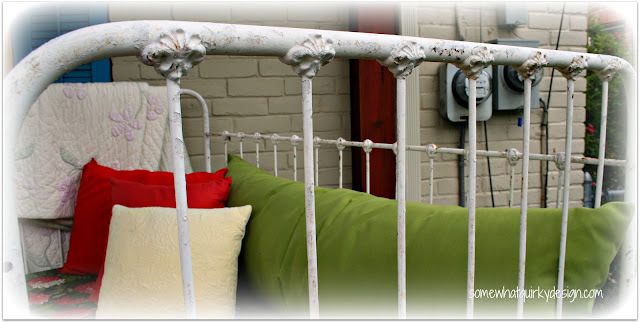 Ten or so years ago I found an antique daybed in one of my favorite re-sale shops in Kansas City. It was $100 and too much for my frugal heart. So I left it there. But it stayed in my mind. And stayed. And haunted my dreams. I really liked this daybed and it just wouldn't let go of me. So a matter of days later when I had some birthday money in my pocket I went back to the shop and bee-lined straight to get MY daybed. It was gone. Gone! GONE! I was crestfallen. I know that this happens to all of you. So I know that you know that just because an item is gone from the store doesn't mean it is gone from your mind. So as I was chatting with the owner of the next store I went to, I of course had to tell her about my broken heart. My broken, daybedless heart. Well, as all good shop owners would do, she mentioned that she had an antique crib that she thought might work for what I was thinking of and might soothe my broken heart just a little bit. She offered to sell me the crib minus the front railing for the same $100 that I was going to spend on the other bed. SOLD! Man, I've got to do something to cover up those meters in the background! I used it in my breakfast room for the remainder of the time in Kansas City. When we moved here I didn't have a place for it so it sat in the garage. I eventually put it on my back porch. It didn't take me long to realize that the makeshift cushions that I had used as a mattress and the vintage bedspread would not work outdoors - even if it was on a covered porch. I have mentioned many times how much it rains here and the poor bed sat soggy for most of the summer. The next spring I went to the Foam Factory and got a piece of outdoor foam. I don't know what the real name of this stuff is. But it is made for use outdoors, water runs right through it, and it doesn't mold or mildew. It is expensive. It cost more than the crib. It is worth it. I covered it with Sun-N-Shade fabric and it works like a dream. The only weird thing is that it started out white and over the 1st year it was out it turned this weird shade of gross. I got over it. The springs are wonky on this so I wove some webbing throughout and I use some old futon pieces for extra stability. 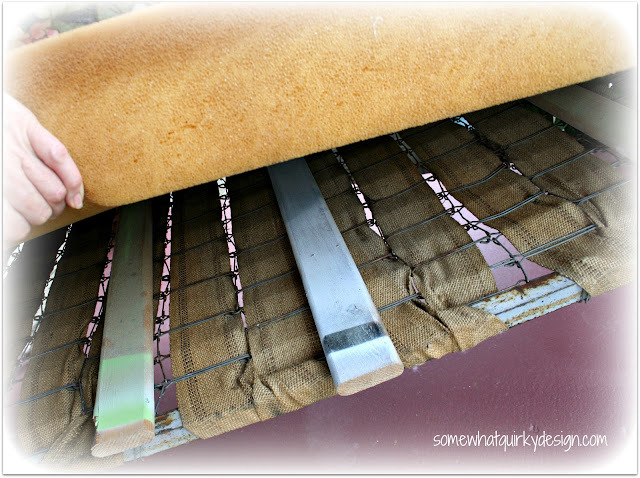 The fabric I bought from JoAnn held up really nicely so I bought more of it this year to use on my refurbished rockers. For this bedcover I just hemmed an appropriately sized piece of fabric and laid it over the foam. I didn't want to make a regular cover because I didn't want to have a layer of fabric underneath the cushion that had to dry. I also used a special thread that they sell at JoAnn that is designed for use outdoors (apparently this is important). The back pillow is just a body pillow still in its wrapper that I bought for a dollar at a garage sale. I figured if the plastic wrapper didn't hold up to the weather that I hadn't lost much. It has worked perfectly (with outdoor fabric). As much as I love my rocking chairs, when I feel like reclining outdoors (and let me tell you - reclining is my favorite position to be in) this is my go to place. In fact, I think I will go there now......Come on by, the rockers are empty! I had no idea there was outdoor and indoor foam or thread for that matter. Good to know. I passed up a metal crib like yours two months ago at the flea market and I am still thinking about it. How stupid is that? Next one I find on it's coming home with me. That looks wonderful! 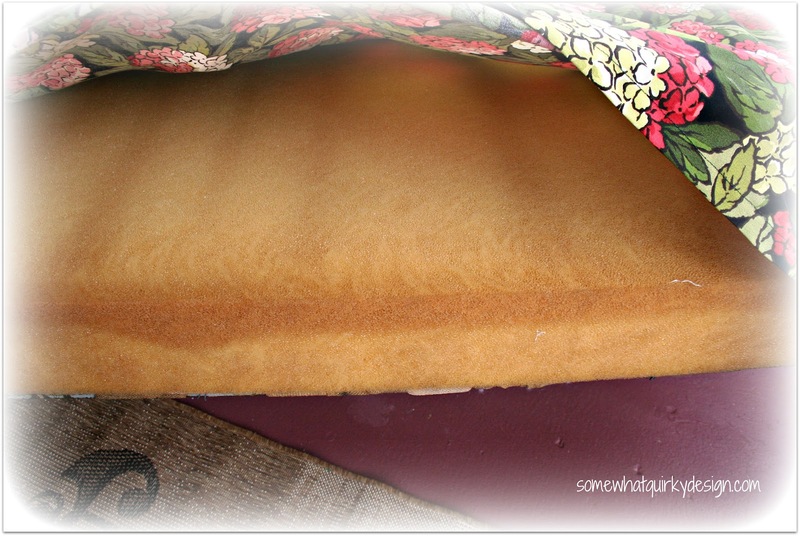 I use outdoor foam too and it's pretty important when you have humidity like I do! Good choice! 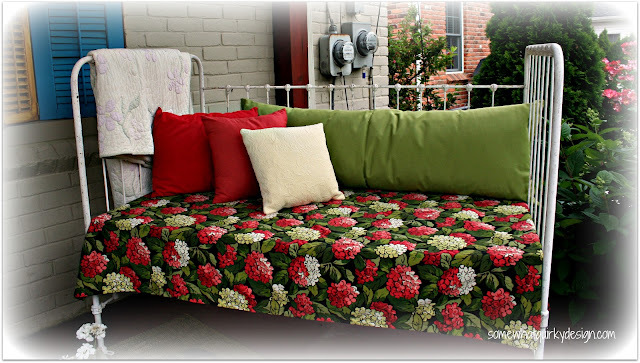 I still have my spool bed settee in the shop and NO one has bought it....I hope I get to keep it! How nice for a spot to curl up and look at magazines and sip iced tea! 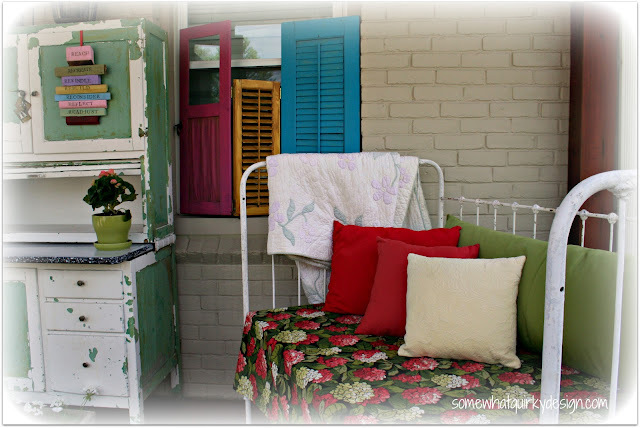 I love day beds - I only wish I had space in my house, or a lovely porch to put one in. Yours looks gorgeous, and inviting ! I love these old repurposed pieces! How fun! Love your iron daybed. I love anything iron. 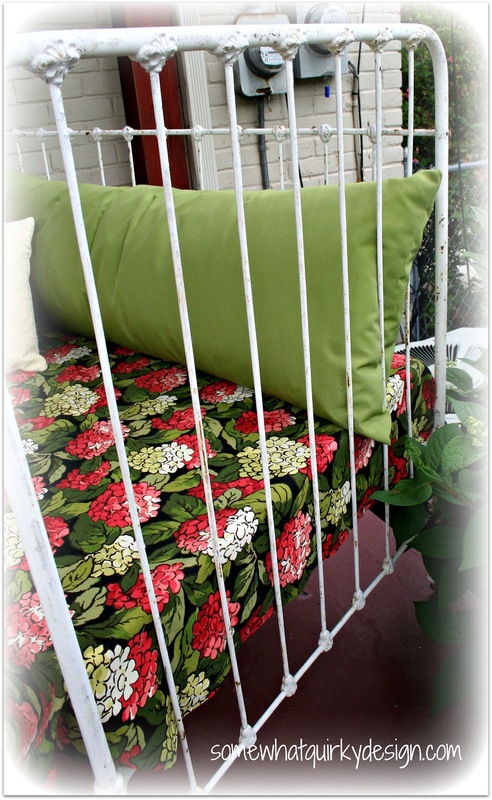 :-) It looks so comfy and charming on your porch! This is so cute, thanks for sharing! I’d love it if you’d link up to TA-DA TUESDAY <3 from your newest follower I’d be delighted if you’d follow back! I love what you've done with your crib, how did you find the back piece? I have a cast iron bed that I've been meaning to use in this capacity, but my neighborhood is just so full of wild life I'm afraid I'll have a family of skunks or raccoons moving in. Love your choice of colours. I LOVE THIS! I would never get anything done if I had a napping spot like this! Oh I love it...and if you find an old door or some shutters...you could place it behind the bed and you wouldn't see the meters!! Just a thought! I just love the bed and the red and green decor with it! It's awesome, and so are all your fixes to make it livable and dry - so awesome. What a unique piece! Aren't you so glad you did not get the original day bed? 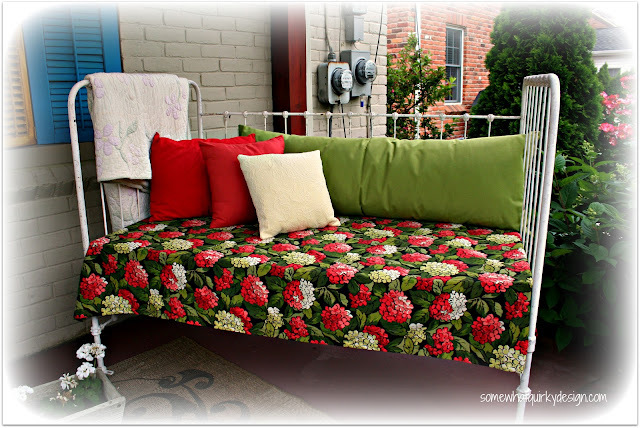 Your crib turned daybed/ settee is so full of chippy character! Thanks for the tip about the "outdoor foam" I want to make outdoor chair cushions and had no idea where to start! This post would be perfect for TUTORIALS TIPS AND TIDBITS, a new weekly linky party at StoneGable. Post goes live 8:00 pm Wednesday. Your tip about outdoor foam is great!